We got some awards!! First, one that is filled with mind altering nip! Can't go wrong there! Thank you Sarah at Three Cats and a Girl for the award! This award was started as a celebration and so to officially receive it, I'm suppose to tell everyone what I want to celebrate. Hmmm... so many directions I could go with this. In this moment, I will celebrate the good health of Laura, Nahum, Willow, Theo, Rose, Buddy, Oliver, MK, Oliver's unnamed boy and girl, Hershey and myself. No telling if we will be healthy tomorrow but that's irrelevant because in this moment we are alive and well and that's something to celebrate!!! Yahoo!!!! So, what better way to celebrate than with lots of nip!?! 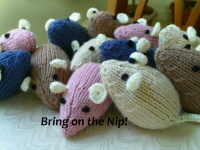 Come on over for a nip party!!!! 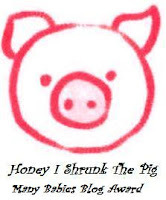 And, I just received the highly coveted Honey I Shrunk The Pig Many Babies Blog Award from Karen Jo at Herman's Hideaway!! My heart still hurts for Karen Jo, as sweet Herman crossed the bridge not long ago. It feels like it's been a full season of friends crossing the bridge between Herman, Deb's Cali over at Just Cats and of course JudiBug. As I mentioned earlier, I'm so thankful that all my kitties are doing well at the moment. It's just a matter of time before I will have to say goodbye to them. Greg over at The Feline Cafe - his blog changes theme from time to time, but he's back to cats now. Although to be honest, I liked the stereoviews too! Random Felines - I don't know name of the human who oversees the random felines, but I do know she does amazing rescue work for cats! She recently has been helping out with some kittens who need a lot of medical attention. Please consider donating or buying something at the holiday auction to help raise money for the medical care of all these needed kittens she is fostering. Kittykid Kreations - Josie started this blog awhile ago and hasn't updated it in awhile. She makes handmade crafts for pets and sells them to raise money for her locale Humane Society. Maybe if she gets an award and some more traffic to the blog she might make more stuff and post more! Holy cow, my kitties Chloe & Moe are on their way! Oh when we have a nip party it's a doozy! Congrats on the awards! Wow, someone is swimming in nip! Do you hear the Thundering Nip-Crazed Horde? That's us! Thanks for the award(s). I am busy and will say someting when I figure out who to pass them on to. We were so happy to see you had stopped by our bloggie! We were beginning to wonder where you had gone. :) We are sorry we haven't stopped to say hi in so long...our silly mommy is taking her sweet time unpacking at our new place!! Congratulations on your awards! We are happy to hear that you are all healthy and seem to be doing well. Concatulations on your awardies. I love visiting you..always have. Oh my gosh! 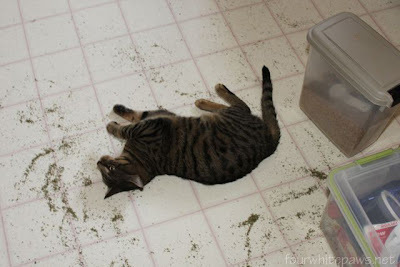 That is some nip party ~ rolling right in it! 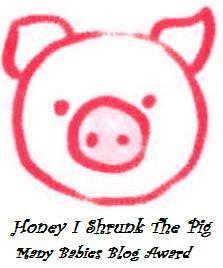 Haha ~ cute! I would have loved rolling in the nip there. MOL but I will ask mommy to spread some out for me.